Last Saturday night, there was another decision in a high-profile boxing match that had me wondering about the state of judging in professional boxing. Are these judges in the pockets of the promoters or are they simply incompetent? Just when I thought the Canelo win over Golovkin might take the cake as the worst decision in 2018, here comes Wilder and Fury. At the Staples Center in Los Angeles, before a packed house of 18,000 fans, undefeated WBC heavyweight champion Deontay Wilder (40-0-1 / 39 by KO) and undefeated lineal heavyweight champion Tyson Fury (27-01 / 19 by KO) fought to a split decision draw. The official judge’s scores were, a ridiculous 115-111 for Wilder, 114-112 for Fury, and 113-113 a draw … my scorecard was 8 rounds to 4. I gave Wilder two 10-8 rounds due to the two knockdowns he scored, which totaled in points to 114-112 for Fury. Before the fight I picked Wilder to win by a late TKO stoppage and that almost played out. But give Fury credit for sticking to his game plan and boxing nicely from the outside, in a comfortable countering range. Wilder tried to catch Fury off balance and rushing with big punches. Fury appeared to be in control from the start, with his best round coming in the seventh. In round nine Wilder threw a right as Fury was showboating in confidence. It caught Fury on the top of his head and dropped him. Although not hurt to the point of being stopped, the punch certainly changed the script of the fight. Fury composed himself to win the next round and regained his momentum. 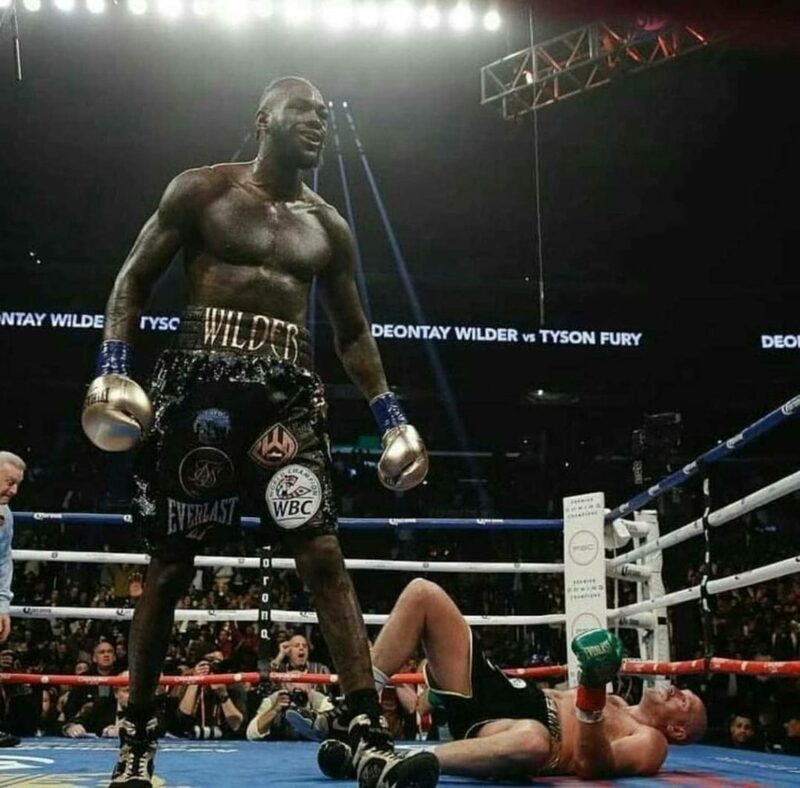 But it was round 12 that really changed the fight for Wilder, as he connected with a vicious left hook that dropped Fury to the canvas like a lead weight. It appeared he would not get up, but miraculously he beat the count and finished that final round. That knockdown, caused judge Phil Edwards to score the bout 113 – 113. Thus the fight was ruled a split draw and Wilder retained his championship title. Incredibly, judge Alejandro Rochin had Wilder so far ahead (115 -111) on points, even if he would have given round 12 to Fury by a score of 10-9, he would still have Fury losing the fight on points 114 -113. With the draw, it appears a potential unification mega match with WBA/WBO/IBF undefeated heavyweight champion Anthony Joshua (22-0 / 21 by KO) will have to wait until a Wilder vs. Fury rematch. But why bother watching? With decisions like this, are we really seeing a fair athletic contest where the best man wins? Or, is it all contrived to separate us from our money? Earlier on Saturday, from Quebec City, Canada, Oleksandr Gvozdyk (16-0 / 13 by KO) scored an eleventh round knockout over Adonis Stevenson (29-2-1 / 24 by KO) to capture the lineal WBC light heavyweight championship. After dropping the first two rounds, Gvozdyk opened up the attack and at the start of the third round, dropped Stevenson with a lead right hand. But incredibly, Canadian referee Michael Griffin ruled it a slip – which it clearly was not. From rounds three through ten, Gvozdyk continued to land crushing right hands to the southpaw Stevenson. He dictated the pace of the fight, landed the more telling blows and won those rounds, or so it seemed. Round ten was Stevenson’s best round in the fight when he rocked Gvozdyk with a left hand, drove him into the ropes and had him holding on. But Gvozdyk recovered nicely and finished the round with some beautiful combinations of his own. However, I scored this round for Stevenson. At the end of ten rounds I had Gvozdyk comfortably ahead winning 7 rounds to Stevenson’s 3, for a score of 97 – 93. The amazing thing to me, is that after ten rounds, two of the three judges had Stevenson ahead on their scorecards and the third had it a draw. Judge Jack Woodburn, from Canada, had Stevenson, who lives and fights out of Canada, ahead by an unbelievable score of 98-92. He gave only two of the ten rounds to Gvozdyk. In a post-fight interview Gvozdyk’s trainer, Teddy Atlas, called this score “criminal” and I think he’s right! In round eleven, Gvozdyk ended it with a series of well-timed combinations, followed by a brutal right hand as Stevenson slumped to the canvas. With Stevenson crumpled on the deck, referee Michael Griffin called a halt to the bout at the 2:49 mark. Thus, avoiding what could have been a catastrophic robbery of Gvozdyk had the fight gone the distance. Presently, the light heavyweight division is loaded with talent! I can only recall one other time when the division was so deep! Back in the 1970’s we had Bob Foster, Vicente Roldan, John Conteh, Jorge Ahumada, Victor Galindez, Marvin Johnson, Eddie Gregory, Matthew Saad Muhammad, and Yaqui Lopez. Today we have Oleksandr Gvozdyk, Dmitry Bivol, Artur Beterbiev, Eleider Alvarez and Badou Jack. There will be some great matchups down the road in this division, but only if these fighters are allowed to fight each other. In the befuddled world of today’s sanctioning bodies … that may not necessarily happen. On a closing note, in my 57 years in boxing, I can’t recall a time when we have seen, on a regular basis, more controversial, if not outright fraudulent decisions in major, high profile, professional boxing matches. Until boxing cleans up its act and holds ring officials accountable for their actions, and until the conflict of interest, politics, corruption and outright nationalism are taken out of professional boxing, why should we as fans continue to fill the pockets of greedy promoters who thrive and flourish under these conditions. How many more decisions like these do we need to see before we as fans finally say, “enough is enough” ? About the same as me for Wilder vs Fury. I had it 9 3 Fury and up by 4. Gvodzyk vs Stevenson was a war. I pray Stevenson recovers.